While Klopfer has served me well, it is time for an upgrade to my track vehicle. What does that mean? That means a new toy. What new toy? 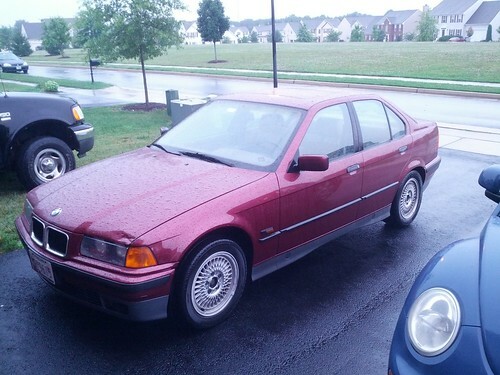 A 1995 BMW E36 325i 5 speed sedan. SEDAN? Yeah....there aren't many coupes on the market that are in anything resembling good condition. Now for my shameless plug for promotion/support. 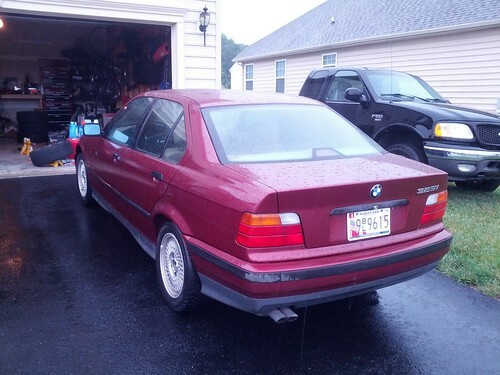 Obviously a 19 year old car that didn't belong to someone who tracked the car is going to need some work to get it track ready (and MD Inspection ready...currently on temp tags), but I have plans for what I want to do. I am hoping to find a sponsor to help me get this car buttoned all up and ready for the track this season (rather than waiting till next year). I really want to get some track days under my belt in this car this year so I could possibly do some time trials next year (Current inclination is to participate with SCCA). This is also an important thing for any company that might want to help me with the car because you can get involved early...who knows..maybe I will end up being good at time trial. Right now I am looking for parts credits or at least discounts to help me get this car together and in exchange I am offering to carry your company name on my car (in a size reasonable for the discounts/credits I am receiving), photos of the car on track, videos from my events of laps around the track and product reviews. I won't be able to get the car squared away before this weekends SCCA event nor next week's Friday at the Track, but since I am an instructor, I end up at a lot of track events. I still have several events left this year including Hooked on Driving at Pocono, NASA at Daytona, Track Daze at VIR, one more SCCA at Summit Point, and several more Friday at the Track events, so the car will have lots of exposure. (Considering a couple other events as well). So, what do I need to do to the car? First round is suspension, brakes, brake flush, alignment, and tires. I did the cup kit install and full brake upgrade on my rabbit, so I can tackle the labor on those just hoping to find some help in the parts department (and maybe tire department). Want to help out and throw your name on my car but don't sell car parts? Well, make me an offer, I don't mind straight up cash infusions either (besides parts, I also have gas on track and to/from truck in the beast in the background so that gives me a bit more flexibility). I have reached out to two companies and am waiting to hear back. One of them I have ordered a lot of parts from in the past and will probably making a significant percentage of my new parts purchases from them unless I develop a partnership with a different company. Current upgrades I am considering. Currently plan on leaving the engine stock to leave future Spec E36 competition open as an option. You can email me at mike at mikecrutchfield dot com if you are interested in helping out with the car.